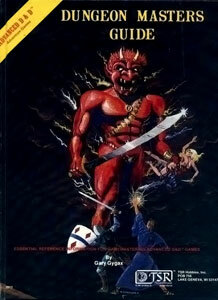 The AD&D Players Handbook by Gary Gygax came out in 1978. This, of course, is the line which – ultimately – didn’t die out. Here too we have level limits, and the reasoning behind them was explained (in the section quoted in the original article) in the first edition AD&D Dungeon Masters Guide – which was really the first book to explain the reasoning behind anything in the game system. A rather interesting result as well is that if you expected a long term campaign, you would multi-class and come out roughly the same. Halflings would be Psionicist/Thief, Gnomes would be Illusionist/Thief, Dwarves would be Psionicist/Fighter or Fighter/Thief, Elves would be Fighter/Mage and Half-Elves would be Ranger/Mage or Ranger/Priest. With that, each of the races would keep advancing while the Humans kept going, only they’d have a broader skill-set, but you also pretty much get the pigeon-holed race as class as a result. No reason for an elf to be anything but fighter-mage, no reason for a Halfling to be anything but psionicist-thief, so that’s what they all obviously are. It also strangely fixes the problem of wondering why there aren’t any Elf thieves or Halfling priests – the answer is there are, just not among PCs. Here I’m afraid you’re mixing third edition mechanics into an examination of what demi-human level limits were about in earlier editions. That’s why the title of this article is “What WERE Those About?” – in the past tense. As noted, third edition can be tweaked to achieve the same general human-dominant result if you so desire. In first edition the notion that “you would multiclass and achieve the same thing” makes no sense. First-edition multi-class characters progressed in both classes at once – and multi-classing was reserved for demihumans. Dual-classing (the closest equivalent to third edition multiclassing) was reserved for humans – and the increasing experience point scales guaranteed that a dual-classed character would shortly be a mere one level behind his or her friends if he or she had dual-classed before twelfth level or so. That was a result of the old-style doubling experience tables. Friend, I’m not suggesting your opinion on the merits of level limits is wrong, but there was a clear line of thought involved in them. Whether they are good or bad, Gygax had a specific reason. He thinks you are confusing it with 3rd edition because you apparently do confuse how the multiclassing and dual-classing rules worked. I immediately thought the same when I saw your post. I’m sorry if that’s not what you meant, but what you actually wrote leads one to think that way. People did indeed use level limits, though sometimes grudgingly. I don’t quite know if mean that to be so literal, but yes, people did actually use those rules. Not everyone liked it, and there was a huge debate on the matter. An extra +4 bonus on *everything* is rather beefy. In fact, it’s by far the most powerful bonus you can get short of +4 and up templates. And you’d have to answer why humans were supposedly so good at working with one another compared to halflings, dwarves, and elves – who were hardly known for being uncooperative in comparison. Frankly, it doesn’t even pass the sniff test, and proposing it as a “solution” doesn’t either. You’d have to make humans a much different race in the game than in reality. And that’s fine, but it’s not really DnD, either. In any event, the point is that it wouldn’t fix the perceived problem anyhow. You’d certainly get humans dominating at low levels. That doesn’t mean you’d get any more humans at high levels – there are only so many adventurers to go around and it’s not going to make that much a long-term survival difference. You’re still going to have Elven Archmages outclassing everyone else sans level limits and under the original rulesset, armed to the teeth with magic goodies. Finally, I’m not sure exactly what rules you are referring to at the end, but it’s simply to true that you’re limited to 1 spell/round. In fact, it’s quite possible, albeit difficult, to get to a great many spells per round and grab much more powerful spells to boot. it all depends on your magical gear and the time you take to research spells… both of which the elves with no limits have in abundance. Personally, I prefer other ways to limit the matter than level limits, but your concept here just doesn’t work. It won’t really fix the problem, drastically changes the setting, and causes all kinds of issues for the game. I’ve never been quite sure about addressing people as “friends” when I don’t actually know them. It always makes me feel like I’m selling something a little bit sleazy. On the other hand, apparently most of the rest of the world doesn’t agree with “The only way to be polite is to thoroughly analyze everything you say – because anything less would imply that I was either ignoring you or not taking you seriously”. And I don’t think I’m rich enough to qualify as “eccentric” either.